If you want to know just how awful a week it's been on Wall Street, look no further than gold and utilities. Both have held up quite nicely while stocks have done their impersonation of Felix Baumgartner jumping from space. Speaking of which, even GoPro (GPRO) has gotten hit hard during this recent sell-off. The stock plunged Thursday after GoPro CEO Nick Woodman and his wife gifted shares to a new charity of theirs. By doing so, they'll be able to sell some of their stock before the IPO lockup period expires. It was unclear if the charity actually intends to sell GoPro stock, however. But I digress. Back to gold and utilities. Gold is a classic fear trade. It often does well when investors have a case of the heebie-jeebies and want comfort in something they can hold, touch and easily understand. 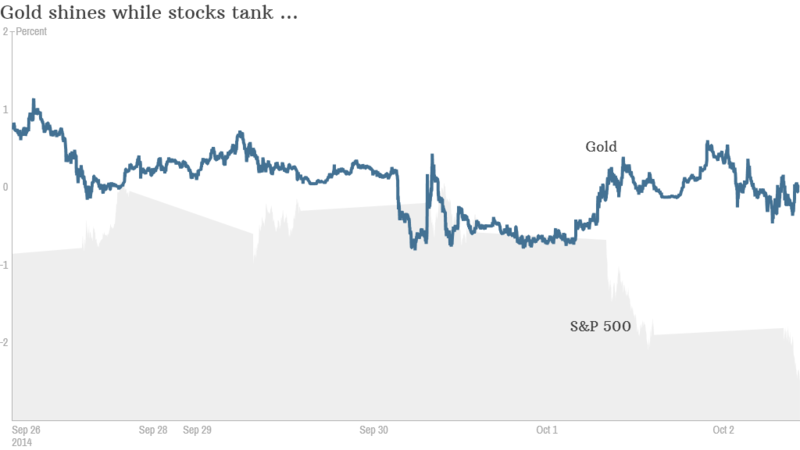 That's why it should come as no surprise that gold is holding its own this week as Ebola in the United States and protests in Hong Kong have investors feeling a twinge of unease. Will Rhind, managing director of investment at the World Gold Council, said that gold may be benefiting lately from expectations that interest rates in the United States will rise. Gold is also viewed as a hedge against inflation. He added that with many people talking about how bonds and stocks could be in a bubble, that could help gold too. Then there are utility stocks. 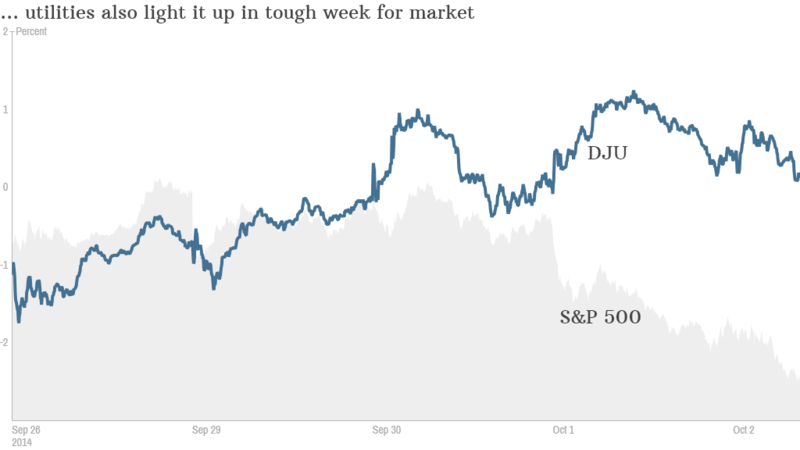 The Dow Jones Utility Average finished Wednesday higher even as the more famous Dow 30 fell 238 points. There is only one reason for utilities to do that well. Yields. This is not a dynamic growth sector. Electric companies such as Duke Energy (DUK), Exelon (EXC) and Southern Company (SO) pay dividends that yield more than 4%. That's significantly higher than a 10-year Treasury bond. Real estate investment trusts, another sector known for huge dividends, has escaped the broader market's wrath as well. The Vanguard REIT ETF (VNQ) is up over the past few days. "Investors are looking for yield anywhere they can get it," said Sharon Stark, fixed income strategist for D.A. Davidson & Co. "It's been a tough year for bonds." So I guess there's always a bull market somewhere ... even when the sky seems to be falling. We'll see how long it lasts though. 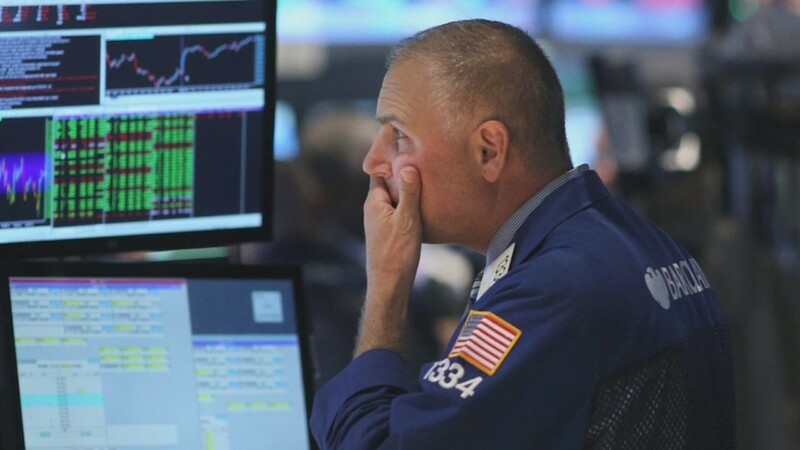 Investors shouldn't go overboard with some of these fear trades. A pocketful of gold and some utilities in a diversified portfolio makes sense as a defensive move. But these kinds of investments are likely to lag if the stock market gets back on track. Reader Comment of the Week! I tweeted this on Wednesday after the Italian-owned member of Detroit's Big 3 reported strong sales. "I got me a Chrysler. It seats about 20. Wow. Sales for that Italian-owned Big 3 company up 19% in September. Huge gains for Jeep and Ram." "@LaMonicaBuzz Profit = jukebox money? #B52s"
Well-played, Brian. Tin roof ... rusted!